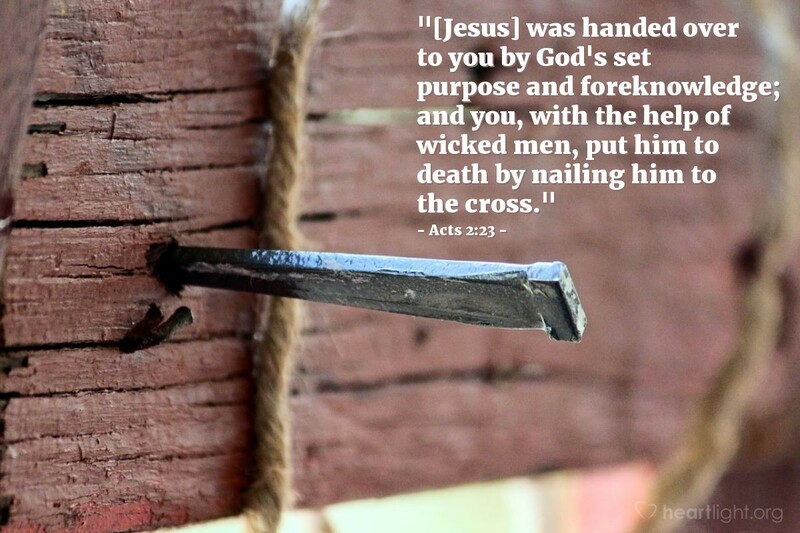 "[Jesus] was handed over to you by God's set purpose and foreknowledge; and you, with the help of wicked men, put him to death by nailing him to the cross." When we think of the Cross, two words we must never associate with it are the words "tragic accident." Peter makes very clear that two separate streams of power converged at the cross. Evil had its way and brought the Son of God to the Cross. God had his plan and he allowed the cross to happen to redeem us. The Cross was no accident. What hell had intended as our ultimate defeat, God used to bring us redemption and triumph. The best and worst of all things collided. Of course the Cross wasn't the ultimate answer in this battle; the empty tomb and the resurrected Lord are. We are the victorious recipients of this grace, paid at such an agonizing cost, administered in such a cruel manner by our greatest adversary, and secured by Jesus' triumph over the grave. Holy God, thank you for having a plan in place that insures that my sins can be forgiven and my future with you is secured. Thank you for paying the price for that plan to work. Thank you for triumphing over the wickedness of hell and the work of evil people. I love you so much for all you are and all you have done for me. In Jesus' name I pray. Amen.